Saturday April 13th 2019 8am-noon. 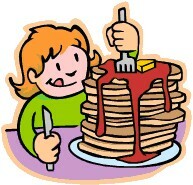 All you can eat pancakes, sausage, coffee, juice and milk, hosted by RSVP Volunteers. $4 ($5 day of) for breakfast, or $8 ($10 day of) for breakfast AND show tickets, saving you $2! Come have a great breakfast before the 1pm Saturday show, and see some of the cast and crew before the show. Breakfast is located in the "activities room" (R-221) near the gym. Click here for printable pancake breakfast flyer.